Warning: you better have a comfortable chair before attempting to read this 9,000+ word post in one sitting. 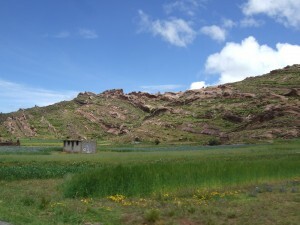 Leaving Cuzco was the normal adventure. We started on the road that looked most promising, which inevitably turned to thick horrible mud. A quick stop for directions at a gas station showed us to be a block off the road we actually wanted, and before long, we were headed in the right direction out of town. Being in a mountain valley, that meant climbing more ludicrous switchbacks up, up, up over the city. In a matter of miles, we were on an enormous high plane. The world was flat, covered in grass, and cold. 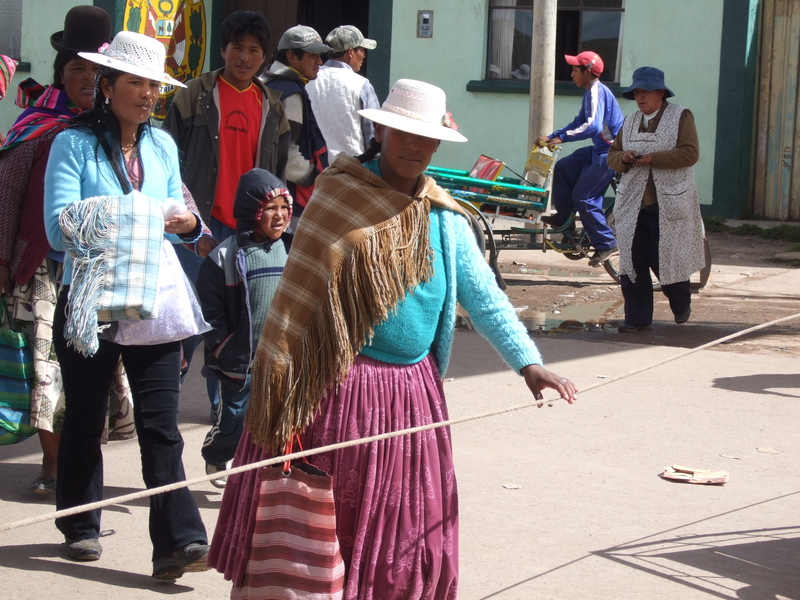 All the people around were outfitted in native garb and most were herding sheep and alpacas. Most of the mountains that stuck up were ice capped, and the temperature was hovering above 40 degrees. We pass through numerous mountain villages where the ancient looking buildings are made of field stone and thatch, and the shops don’t bother with signs. 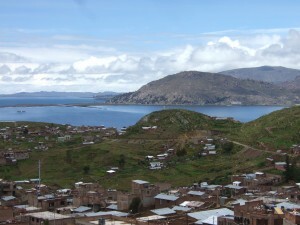 Just before reaching sight of the infamously poorly named Lake Titicaca, we get pulled over for the first time in Peru. There are two cops, and my Dad and I speak to different ones. Mine asks about health insurance and I show him my old Microsoft Health card, which will do me exactly no good with the possible exception of getting me out of a situation like this. They hee-ed and haw-ed for an inordinate amount of time, insisting my insurance was no good in Peru, and eventually gave up on suckering us out of a few bucks, and told us that since we didn’t have insurance, we should be careful. Good advice, thanks. Soon, one of the “highest commercially navigable lakes in the world” was visible, and beautiful, and the rain came with it in buckets. 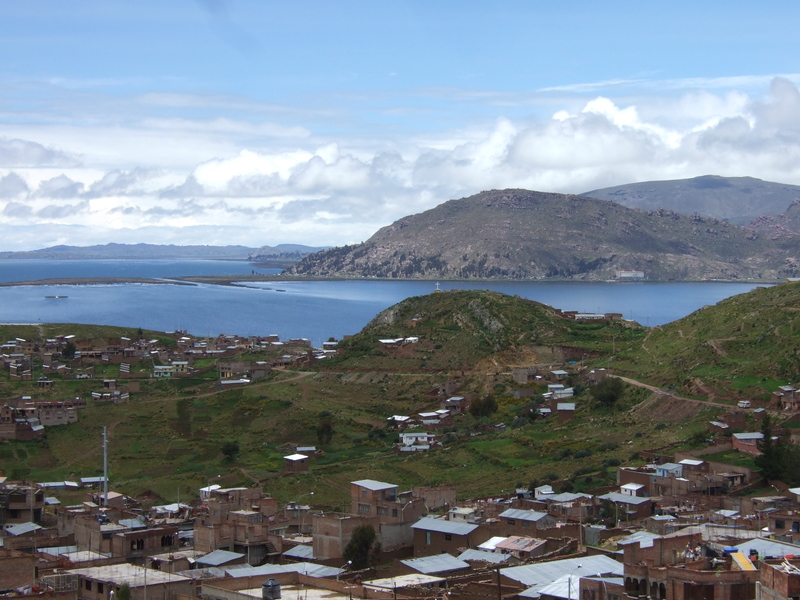 We were up in the mountains and eventually came around a big bend and found ourselves gazing at the scenic and mountanous coastal town of Puno. We headed down into the city (to return to the beautiful overlook the entrance afforded us the next morning to take the above photos) and the rain poured. We found a stretch with 3 hotels, all of which listed their prices in dollars, but only one of which had a place to park the bikes. Getting the bikes actually into the garage was an adventure in and of itself, as it had two concrete ramps for car tires over a several foot drop into deep mud, topped off with doorways on either end we could only get the bikes past by taking the panniers off. But the place came with a half-broken heater that was enough to partially dry most of our clothes, so we were thankful. We headed to dinner after setting our things to dry, and found a reasonably priced restaurant where I tried Alpaca. It tastes just like beef. The center of town was absolutely jumping even though it was dark and raining. Unbelievably given the time, the central market was still open, and we checked it out. I bought a big bag of Coca leaves ($0.30) to make tea and nearly a pound of delicious black olives for $1. Afterwards we retreated to our heated room and caught up on some much-needed sleep. In the morning after battling to get the bikes out of the ridiculous garage, we cruised around the city and found the coast. I also marveled at how Latin American advertising seemed to know no bounds. Ever since Mexico, we’ve seen stores, houses, fences, and walls covered in ads for either drinks (mostly beer) or telephone companies. Entire towns are painted in alternating colors of rival cell phone companies. In San Bartolo, a long municipal concrete fence around the main beach had a beer logo hand painted on it every 10 feet. 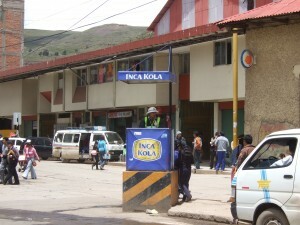 Puno has to win the award though, with their traffic cops sitting in huts with the Inca Kola logo on every side. It was easy to make it back to the highway, but as usual, that wasn’t enough, and not even a kilometer past where we’d left the highway to enter Puno, the road was closed for construction, with no signs labeling the alternate route. Instead we were dumped into downtown Puno, which was packed with traffic. Following a large truck I’d seen pull of the highway and hoping they knew how to get the hell out of the town, we wound through the city for miles before coming out on the highway, and without stopping for directions. The road out of town hugged the coast and was spectacular, full of wild flowers, mountains, and scenic fields. 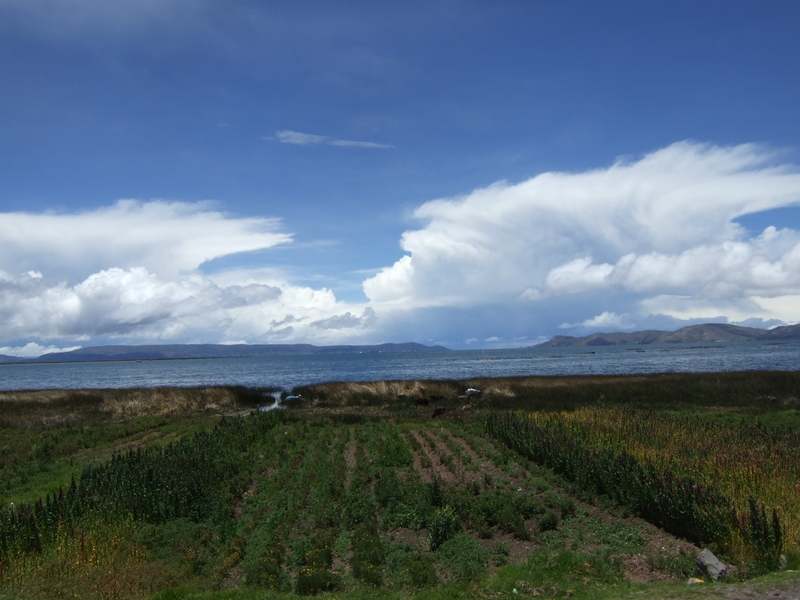 Our final stretch of Peruvian road was pretty shaky, but from Puno, it was a short jump over to the Bolivian border. The border town was thankfully small, but traditionally dressed locals were still crossing like it was going out of style. Bicycle taxi and cargo carriers with Peruvian and Bolivian flags crossed constantly, ferrying people and goods back and forth. Joe was in charge of getting our exit stamps this time, and the line was thankfully relatively short. 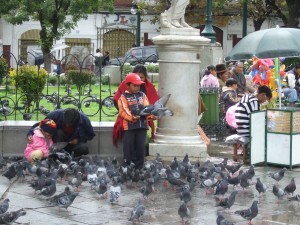 The Peruvians didn’t bother looking at me before stamping my passport. 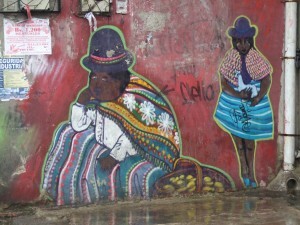 Bolivia was another story. Also woefully poorly labeled and including a long difficult journey for a photocopier (Joe this time thankfully for me) before running into Bolivia’s gift to those of us with US Passports: $135.00 USD Visa fee (the first way Bolivia fucked us, and really the most understandable). Why can’t I be from Canada when I travel? After wasting a ton of time filling out paperwork at Immigration, we followed an official’s directions to Customs. The road was full of bumps and potholes, packed with parked cars, and deserted of any official looking buildings. They’d told us to look for a tall antenna, but the only one we saw was on a dump of a building with no signs and broken windows. I would have blown by it but my Dad went in to check, and shared my amazement when it was, in fact, the customs building. The people at customs were super friendly and one even spoke some English. The process was still lengthy and ridiculous, but eventually, after our usual 3 hours at the border, we were on our way towards La Paz, a mere hour away from the border along a fantastic highway. At least, it should have been an hour. But I stopped about 10 minutes from the border to pee on the side of the desolate highway, and when we went to leave, my Dad’s bike wouldn’t start. Over and over again, playing with the choke and throttle he ran the starter, but nothing happened. We’d mostly given up on the bike and were discussing what to do when Joe finally got it started again by draining the gas from the carb, which seemed to be stuck open. Running ragged at anything less than highway speeds, he fought his bike to La Paz as night fell. We drove through miles of city, working our way up the main highway and checking sidestreets, but could simply not find a hotel. Eventually, the highway seemed to dead-end in utter bedlam. Suddenly instead of heavy traffic, the streets were stuffed with people walking in the streets. Navigating the city, previous hard enough given my Dad’s bike problems, suddenly became unbearable. Small Nissan vans operating like buses clogged what little space was left between the flood of pedestrians. The first hotel we found was in the thick of the insanity, and oozed with fake posh. Besuited bell boys, a lobby with a bowl of white powder (white rocks if you look up close), rooms that look fantastic until you notice the lamp chords have all been spliced and taped together to plug into the one outlet, an elevator that you have to walk to the second floor to use, and breakfast included, but consisting of a scrambled egg and hot dogs – and all for more than we had any desire to pay. But it was a place to stay and there was a garage, so we took it anyways. The second floor of the place was a Discotech, and our room included two free drinks (one each) at the disco, so that became our next stop. They gave us gringos one of the best tables in the place, right next to the dance floor, which was a technicolor glowing checkerboard monstrosity right out of Saturday Night Fever, and complimented by disco balls, rotating lights, green lasers, and yes Virginia, a smoke machine. The music alternated between semi-decent local music and 70’s and 80’s dance music no one in their right mind would subject others to. To both types of music, the locals got up and danced, and all so badly I felt like I’d finally found a country of my equals on the subject. We downed our free drinks plus one we paid too much for. The locals, likely unable to afford the prices, all verrrrrrrrry slowly nursed the drinks they’d purchased. Multiple times in the half hour or so we were there the waiters tried to hawk cigarettes at us, with far more determination than the job of pushing cigarettes deserves. After the disco in our hotel, I decided to hit the town in the unfortunately horrible area we were in. There were no bars to speak of – inviting or otherwise – just tons of pedestrians and dingy looking clubs that looked like far from my idea of fun. 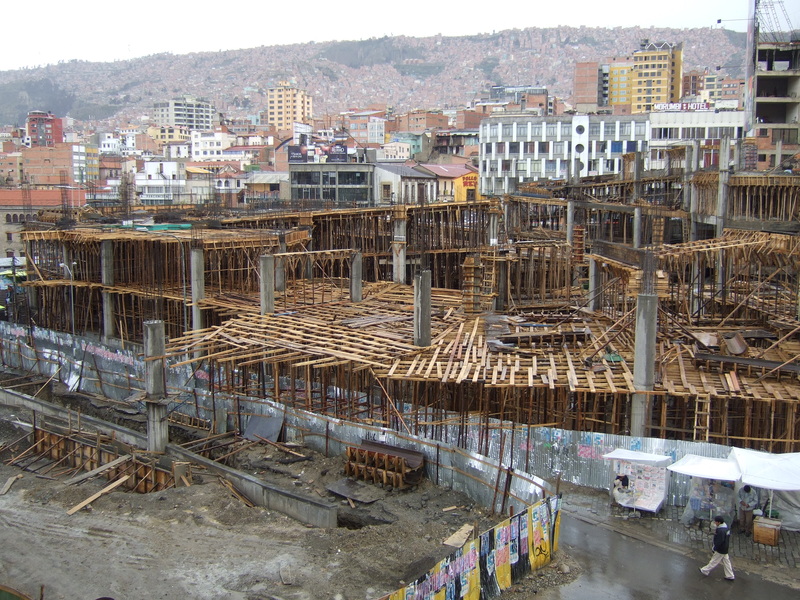 The one thing I did realize is there was a brand new word for a cheap crumby hotel here – Alojamiento – and there were literally dozens of them within two blocks of our overpriced crappy hotel! Go figure! Before I gave up on finding worthwhile nightlife, I happened upon an intersection with garbage piled over 6 feet high, with traffic flailing to get around it. Ahhh, what a lovely neighborhood. Had a great night’s sleep to the not-so-distant thudding of the discotech’s bass, and woke up to the same. We had the crumby breakfast of a scrambled egg and hot dogs, complimented poorly by mixed orange-aide, packed our things, and dropped them at the front desk to hold as we looked for a motorcycle shop. The motorcyclists community Horizons Unlimited got us phone numbers for a couple prospective shops to try, and one, Nosiglia Sport, claimed over the phone to have both front and rear tires in the size we needed! We found a poor map of the city in the yellow pages, and managed to find the neighborhood the shop was in. I took the lead and by luck and random strangers directions, managed to get to the neighborhood we wanted. From there, we found a cab, gave him the address, and paid a dollar to have him take us to the shop. Of course, it turned out the place was less than a mile from where we found the cab, and one the same street we’d been driving on. We went into Nosiglia, a fancy primarily Honda motorcycle shop, and asked about the tires. Someone who spoke only spanish came back and insisted they only had one of the tires we wanted, though I couldn’t understand if he was saying one tire or one size (front or back), but they assured us the guy I’d spoken to on the phone (who spoke english) would be back in a few after lunch. We waited and a guy named German finally came and told us he’d made a mistake, and while they had two good rear tires in our size, they didn’t have any in the size for our front wheels, and ordering them would take 3-4 more days. Also, if we wanted our tires balanced, we’d have to wait till Monday (it was Saturday) as they don’t balance tires, and the shops that do are only open weekdays. We agreed to wait, and German gave us directions to a hotel called the Hotel Sur. 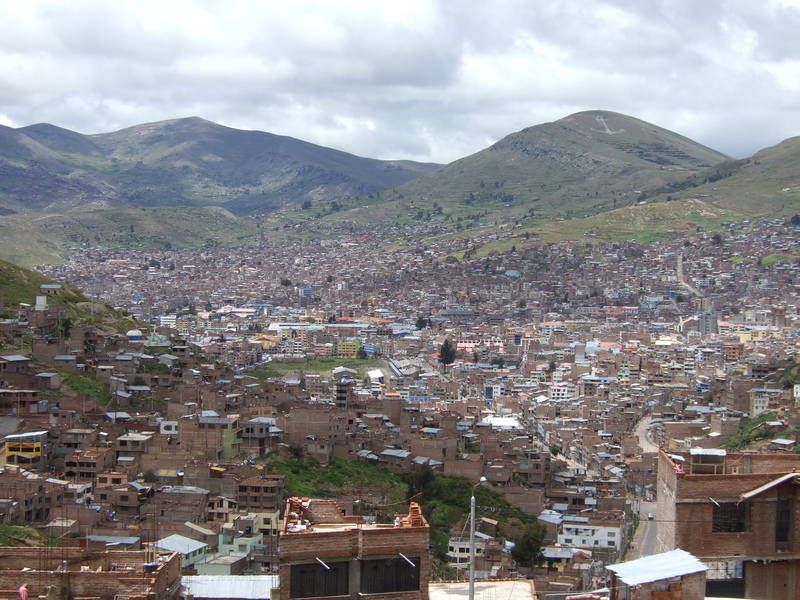 We caught a cab to the hotel, and were pleased to find while it wasn’t terribly cheap, it was extremely clean and totally liveable, so we grabbed it for the night and caught a long cab ride back to El Alto to bring our stuff to our new hotel. After settling in, we took a walk around our new neighborhood and stopped at a hair salon to finally ditch our shaggy visages. We got phenomenal haircuts – I even got shaved without having my face hacked to pieces like the last time I tried in Mexico – and I had a great conversation with the employees and patrons at the place, including the scoop on where to look in the neighborhood for food. We wasted some time at an internet cafe and as it got late, went up to check out the ‘hood we’d been recommended to find food. Besides passing dozens of embassies, we arrived in a neighborhood with Japanese restaurants, Argentine steak houses, Mediterranean food, expensive posh bars, tons of coffee shops, and clothing stores I’d never dream of shopping at in the states (though that’s saying admittedly little). I was super-excited by the prospect of finding sushi, and knowing we’d be there a second night waiting for the bikes, I got my wish first, and we checked out a hole in the wall overpriced sushi restaurant. Everything was decent, though by no means excellent after being spoiled by San Francisco’s offerings, except the audacity of serving us a tuna roll made with canned tuna! I may be no expert on Japanese culture, but I’m pretty sure they’d behead you for that there. Breakfast at the hotel was coffee, bread, and jam. Afterwards we caught another cheap cab up to the central part of the city, and we wandered around taking in the sights. It rained hard off and on, keeping us from making and consistent progress since we hadn’t brought any rain gear. The real downtown of the city was one unbelievably massive market (they were in the process of building a new central market, and in the meantime the booths spilled out into the streets), and we when every street, even nearly vertical ones ascending mountains, were stuffed with street vendors, booths, kiosks, and shoe shiners. 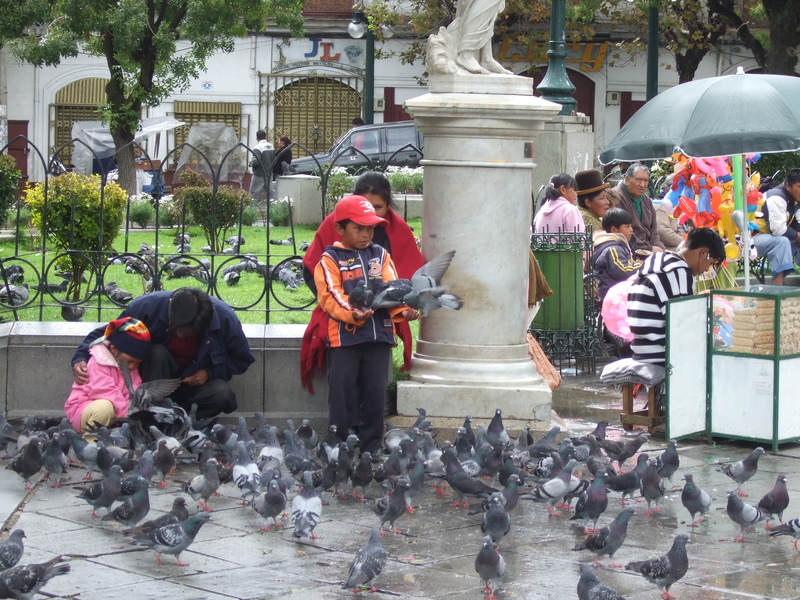 After wearing ourselves our climbing a couple mountains and walking through untold miles of market, we ended up at a plaza with a billion pigeons, with vendors selling feed people would hold in their hand to do their best recreation of “The Birds” complete with crying babies covered in flapping pigeon wings. To get back to our neighborhood, Calacota, we found one of the many vans that serve as privately operated neighborhood buses, and managed to get back to our neighborhood for less than a quarter each. For dinner, Joe had been craving a steak, and we headed to a grill where we spent a good $7 each getting steaks as big as our heads; so big in fact that they were brought with a mini grill filled with charcoal to keep one half warm while we ate the other. We went home thoroughly stuffed. The next morning we called Nosiglia in the morning to make sure everything was going according to plan, but they couldn’t give us details as the head mechanic wasn’t in. German told us to call back around noon, but we decided to just head there instead, and cabbed ourselves to Nosiglia around the time he’d mentioned. The tires were done, but they’d completely forgotten to do my chain, so I had the honor of watching as the mechanic regarded my motorcycle and chain like a monkey huddled around the monolith from 2001: A Space Odyssey. He managed to get the chain installed, and proceeded to tighten down the axle off the bike extremely tightly with a huge wrench, far bigger than what was necessary, and called it done. Afterwards, still in the shop, I went to lubricate the chain, which involves spinning the tire while spraying the lubricant, and found the tire didn’t spin freely. Figuring the thing was just overtightened, I had the guy loosen the axle and tried again. Things worked better then, but there was still far more resistance than there used to be. He insisted it was just stiffness in the new chain, and I took his word. Afterwards we had some delicious (and actually reasonably priced) gyros back in the fancy neighborhood of San Pedro, and made our way out of town, which was not nearly the nightmare it could have been. 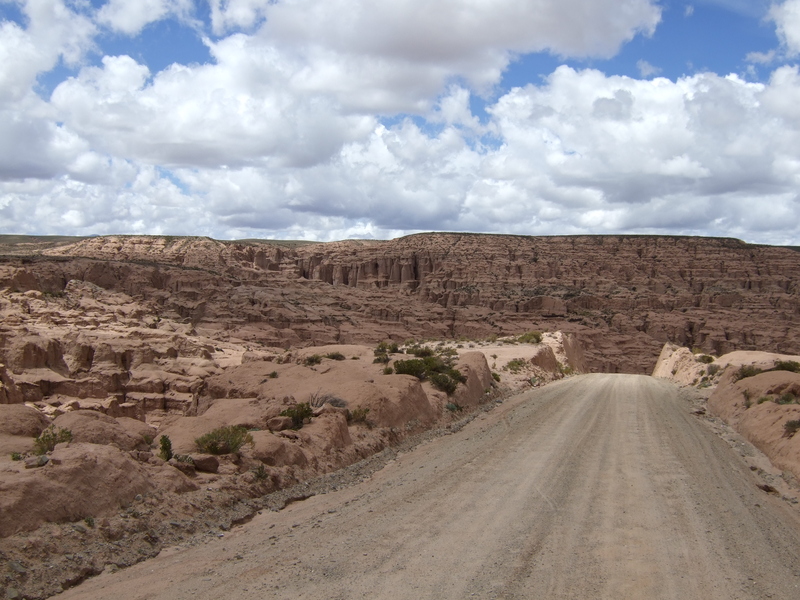 The road south of La Paz was a perfect two-lane highway over flat, boring landscape. To keep things interesting, it started raining heavily, and just as we were trying to make a left turn to put on our rain gear, a semi-truck went flying by us and completely soaked us both. 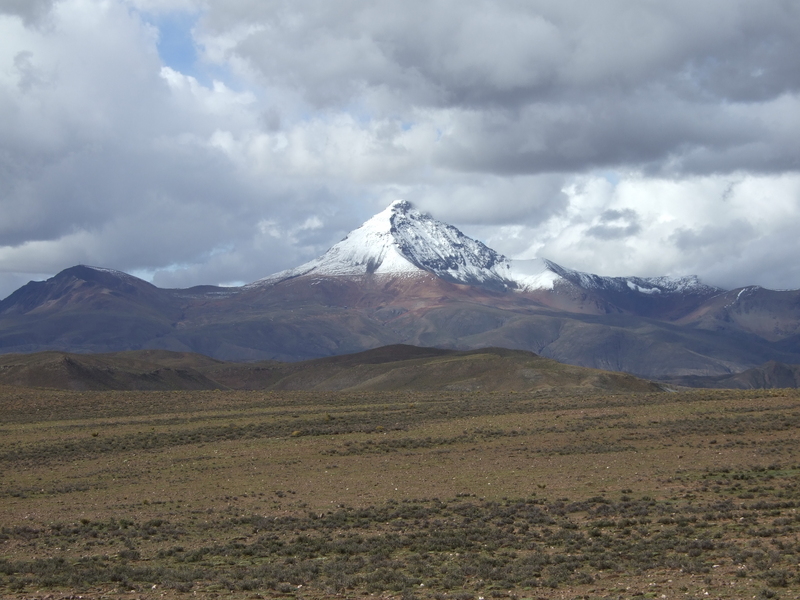 After a boring and wet day of riding, we arrived at the deceptively large, and self-proclaimed Folklore Capital of Bolivia: Oruro. As soon as we got there, Joe’s bike started freaking out, exactly as it had done when we entered La Paz. So he pulled over and I went ahead into the city looking for a place to stay. What a nightmare. I rode around for a half hour without spotting a single hotel, the rain continuing to come down. Finally, I spotted a hotel the wrong way on a one-way street and maneuvered my way around several blocks to get there. A true stroke of luck, the place was cheap, cleanish, had parking, a buffet breakfast, and a spa! I went back and got my Dad and we headed back to the place. After unloading, we had the typical walk to find out where they wanted us to park, where we’re invariably dicked around and put in some strange place so as not to take the place of a car. But this time was a little different, and we were actually made to park inside a gym, directly outside a racquetball court and next to a bunch of lockers. Whatever works I guess? The equivalent of two dollars bought us an hour’s admission to the steam baths at the place. We were amazed when we entered to find the place a labyrinth of over 30 private steam baths, little rooms with showers and steam vents that could be opened or closed. Included in the admission was a bundle of fragrant/medicinal herbs to put over the steam vent, similar to what we had at the sauna in Costa Rica. An hour turned out to be plenty of time, and we left relaxed and exhausted. The buffet breakfast was the best we’d had in quite awhile. There was a giant thermos of water I used with my coca leaves, all the bread, butter, tasty jam, fresh cheese, and ham you could eat, plus cereal, yogurt, and juice. I stuffed myself, we checked out a handy map of the city in the lobby of the hotel to figure out how the hell to get out of town and off we went. Things were slightly more interesting, with a few more mountains peaking around the flat grassland, but still nothing terribly blogworthy, just more rain and cold. In the town of Challapata, we hit a split in the road, with the Panamerican highway going east towards Potosí, and another “paved” road (according to our map) going towards the salt flat and town named Uyuni, which I’d heard was one of the big tourist destinations in Bolivia. 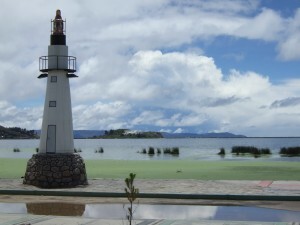 I’d argued, and we’d agreed, that we should head towards Uyuni. Accoring to the map, the road appeared to be shorter than following the Panamerican, plus it had the added benefit of going through the supposedly scenic salt flats. Just out of town, the path became a sad excuse for a dirt road. 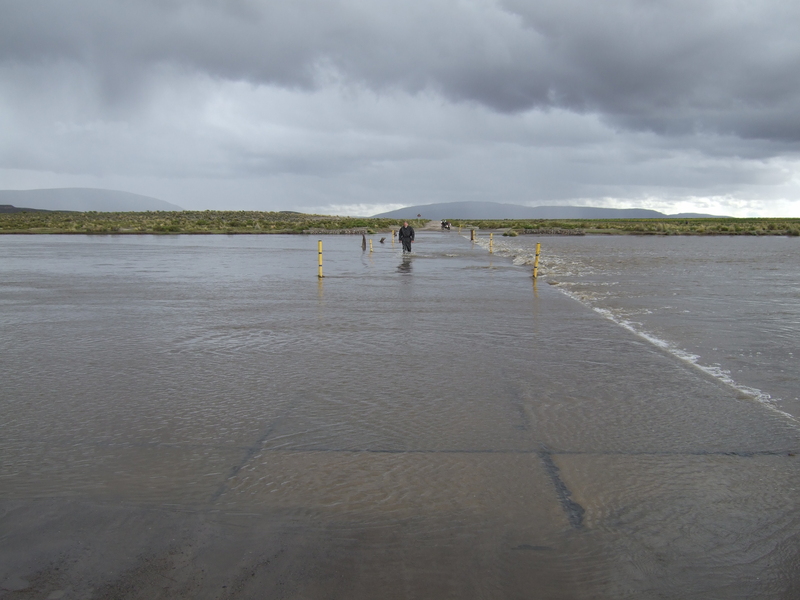 There was mud and huge puddles covering vast stretches of the road, much of the water so deep and wide we had no choice but to go through it, soaking our shoes and the bottoms of our pants in muddy brown water. There was a beautiful, but unfinished, straight paved road parallel to the dirt path we were on, but they’d been kind enough to go far above and beyond the call of duty to make getting onto it nearly impossible. Following our dirt road though, after perhaps a mile, we came across a massive river. We stared in awe at the obstruction long enough to see a truck ford the river, and couldn’t believe how deep and strong the current was. 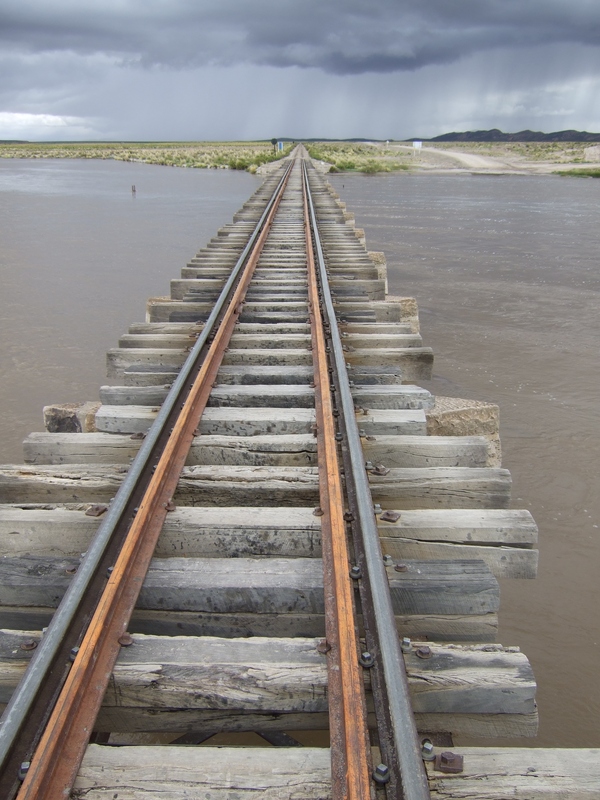 We decided then and there that despite the ten foot tall piles of rocks, the foot+ deep mud, and the pools, ditches, and broken glass, we’d find a way onto the new roadway, since it had a brand spanking new bridge over the torrential river, and would get us on our way again. We tried multiple paths, driving over muddy countryside, running into impassable route after impassable route, till we finally managed to get onto the roadway. We cruised at 60 miles per hour down the rocky but smooth pre-highway, roaring over the river, and made it a good mile or two before coming on the end of the stretch, where the old dirt roadway crossed the path of the shiny new one. 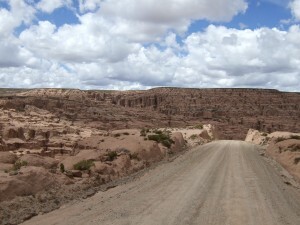 Far from making the transition simple, however, the Bolivians had gone through the great trouble of trying as hard as possible to make the crossing also utterly impassable, thanks to a tremendous wall of rocks between the two, and a deep trench of a ditch on either side of the new road. We managed to backtrack enough to get off the old road (after the river of course), and back to the intersection between the two again over the muddy mess. At the intersection, the old dirt road continued, and another stretch of new road continued, also completely blocked off from the intersection. We sat at the intersection trying to decide weather to try the dirt road again or to try for the next stretch of highway when a big red SUV with a surfboard on top and Colorado plates pulled up. Three Americans, all from Michigan (small friggin’ world) were inside, and exclaimed how easy it would be to make it over the rocks on the new freeway. So easy, in fact, that they offered to go first, and proceeded to plow, though it took several attempts, only the last of which I managed to catch on tape, over the rocks, which our new friends had graciously lowered partly with the grinding bottom of their truck, and onto the new highway. They stuck around as we followed in their footsteps, with the biggest hurtle being overcoming our own fear of losing control flying over the steep rocks. We continued with the SUV for a mere quarter mile before reaching another roadblock in the new highway due to a crossing of the old. Getting off the road was another adventure, this time with mud so mind bogglingly deep I’m still unsure how we managed to get back to the old road. This time, facing another battle to reach the new road only to run into another nearly impenetrable roadblock in possibly less than a mile, we decided to just try our luck on the old road. By now, whatever novelty having to look and work out our path to ride had had was thoroughly exhausted, leaving us frustrated at the state of the road. Back on the old road, we fought for every mile, running into river after river after river, some shallow, some rocky, some deep, and some fast moving. Each left us and our bikes wet and muddy. And worst of all, between each were pocket and after pocket of standing water and deep, dangerous mud, like trying to ride on ice or grease. It was first gear nearly the entire time, puttering along at ludicrously slow speeds, our feet down more than not. Giant potholes, deep loose sand, and a many stretches of road that had been battered into terrible washboard patterns that vibrated the teeth in our head if we went over it faster than 10mph greeted us when we were lucky enough to be out of the mud. The scenery, not that we could have appreciated it had it been beautiful given the road, was nearly completely flat sand devoid of nearly any life beyond scrubby desert plants. After what seemed like an eternity of endless wasteland, and actually only a handful of miles, we came to the town of Sevaruyor, which was a throng of stucco buildings built around a railroad stop, and butted up against a massive river. We had been completely not expecting this sort of hell, and hadn’t started down this terrible path with a large amount of gas. The map showed no towns of any reasonable size until Uyuni, which was a long way away from us, so we knew we had to try to find gas here, one of the “larger” “towns’ on our path. I asked the first passerby where I could find gas and he pointed down a street and told me to look for the red garage. A few more questioned pedestrians later and I came to a red gate. Inside, no one was to be found. Persistently, I shouted hello until a very old woman came out of a building and regarded me with some confusion. I asked if she sold gas and she answered clearly: no. I turned back but the last person I asked was down the street pointing toward the inside of the place and shaking their head to continue. While trying to make sense of the situation, an equally old man came out and started talking to us. He asked many questions, including how we planned on crossing the river, an obstacle we weren’t truly aware of yet. Only after a good 5 minutes of kibbutzing did I get him to answer if he sold gasoline, to which he said yes. He said he sold it by 10 liter increments, so I said we’d buy 10 liters, which cost about 8 dollars, or about $3 a gallon. Once we’d made our order, he grabbed a bucket and filled it from a giant steel drum with gasoline. I then had the honor of holding the bucket aloft while he used a thick rubber hose to syphon gas from the skyward bucket into my tank. We poured the remainder into my Dad’s bike (he still had our gas can if he ran out) and proceeded to talk about crossing the river. 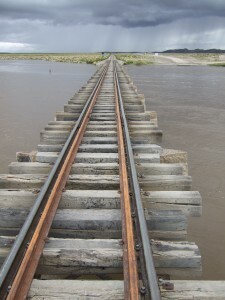 The old railroad bridge... Take my word, those ties are over a foot apart! 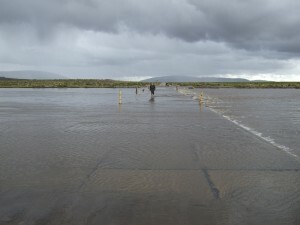 Then we checked out the “carretera” which was, of course, completely underwater, and extremely deep and fast moving. After some discussion, we decided our best bet was to walk the bikes across one at a time, through the deep flowing river. First, I tested the waters, wading 3/4ths of the way across fully dressed, utterly soaking my boots and pants, already mostly soaked from water along the way. After determining it was, in fact, possible, we grabbed my Dad’s bike, and slowly walked across. It was extremely arduous work, the current pushing up over the engine trying hard to push the bike over, but it was heavy enough to stay stuck to the sunken concrete, and though we wore ourselves out, we got the bike to the end of the river. At the end was a huge, even deeper puddle of standing water before the “dry” road began again, and I held the bike as my Dad got on and managed to wade partly controlled onto the bank to park. When Joe got back from parking, we worked on my own, stopping several times out of utter exhaustion thanks to a long hard day, and the difficulty of walking the bikes across. Both made it to the other side without catastrophe, but both of us were beat, and far from happy to be back in the sand and mud of the roadway proper. It was horrible what we were doing to our bikes. I’ve never spent so much time in first gear in my life, but we had no choice. The engines were running hot, we were tired, and every 50 foot stretch of foot deep mud full of truck tracks was another nick into our collective morale. The next town on the map was called Rio Mulatos, but as the sun began to set with us far far far from the Argentine border we’d expected to make that day, we began questioning if we’d even make this town, only one symbol on the map up from being a “settlement” before night fell. We were certain that night would spell only disaster on this terrain, since we only made it through the mud, over the massive potholes, and across the numerous rivers by looking far up the road to make sure the path we chose would keep us aloft. So many hours of such focused riding! Worn down and exhausted, the day going through the motions of rounding itself out, my Dad, riding in front, went down at slow speed in the mud. It was awful to behold as the bike slipped quickly out of control and down, flinging him down into the sludge. It took me a minute to find a place I could park the bike, and I ran over and turned the bike off (the tire was still spinning off the ground). We got him and the bike off the ground. The handlebars had managed to come around and peg him right in the sternum when the bike fishtailed, and he’d hurt his thumb, but nothing was broken, and he was able to get back on the bike, feeling miserable and sore, and utterly covered in brown horrible mud. It was still raining, the road was only a step up from impassable, it was getting dark, and our spirits were riding pretty low (probably because they’d sunk into the mud). We left the road at one point and contemplated throwing down our tent, but cover was nonexistent and the thought of sleeping on the ground after a day like this didn’t exactly sound fun. Plus we only had our emergency rations for food, and man were we starved. So we pressed on. Slowly. As the final shreds of daylight were leaving, we came down a slight hill overlooking the town of Rio Mulatos. The mud in the town was as thick as could be imagined, and right in the center of the small town was a police control point. Directly past it were two, yes two, alojamientos (the lowest grade of hotels), and my heart soared at the prospect of shelter, food, and a bed. I parked my bike outside the first place as my Dad maneuvered to find a place to park where his bike didn’t sink completely into the mud when a cop swaggered out of the hut by the control point and began shouting at me. With his hand firmly on the pistol tucked into his pants (not his holster), he shouted for me to come with him right away, making threatening gestures all the way. Inside his hut, he made me fill out a ledger of vehicles that passed the point incorrectly (accidentally having me put the wrong information into one of the boxes, then pretending like it was fine and having me fill it out incorrectly for both me and my Dad), then he demanded we pay for passage across the checkpoint, something that we’d seen vehicles do before, but that as motorcycles, we’d never before had to do in Bolivia. Furthermore, he was drunk. His speech was slurred and his breath reeked of booze. He brought out his gun and cocked it. Then he told me I wasn’t in my country anymore. 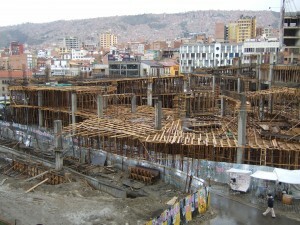 I was in Bolivia. He stormed around the hut, gun in hand, angrily exclaiming how I had to pay. Next, he insisted I get my Dad. I went to walk and get him and he shouted at me and waved the gun at me, cocking it again. He told me to stop and yell to have him come. He even went so far as to try to tell me how to say it in English, saying “Come here buddy” with the intention of me repeating it. I shouted for Joe to come, and warned him the guy had a gun and was waving it around. He came over and joined the fun. Pleased to have topped off our wonderful day with a drunken madman of a cop, we proceeded to the first alojamiento to see how miserable our accomodations for the night would be. Pretty miserable. They lead us into the back of a very dingy building, up a dingy set of stairs, and into a room with two rooms off on either side. Each had several beds, but all shared the enterance in the first room. If you were in the middle room I guess you couldn’t really lock your stuff, not that the rest of the doors had locks either. other than a light on the ceiling and the beds, there was nothing in the rooms except a filthy wooden floor. Bathrooms were downstairs and off to the side. Parking was nonexistant. Dinner was the Bolivian take on chicken noodle soup with rice and a scrap of beef, all served by the condescending xenophobic matron at of our establishment (we weren’t exactly batting 1000 with the locals). The room was cold but the beds had 4 warm woolen blankets, and we slept heavily despite the knowledge that tomorrow we had an even longer day on the horrible road. We woke and had breakfast again (egg sandwiches) at the restaurant in the place we were staying. By now, my smiling and our lack of complaining seemed to have overcome the icyness of our host, and unlike at dinner, we weren’t charged the gringo tax. Guessing we’d be stuck without lunch after a physically exhausting morning since there were practically no towns between us and Uyuni, still twice the distance along the bad road than we’d come the day before, we also bought a couple rolls, and the matron threw in two she’d baked herself seemingly free. We then packed up and hit the road, sans shower for fear of the bathroom we’d be forced to shower in. 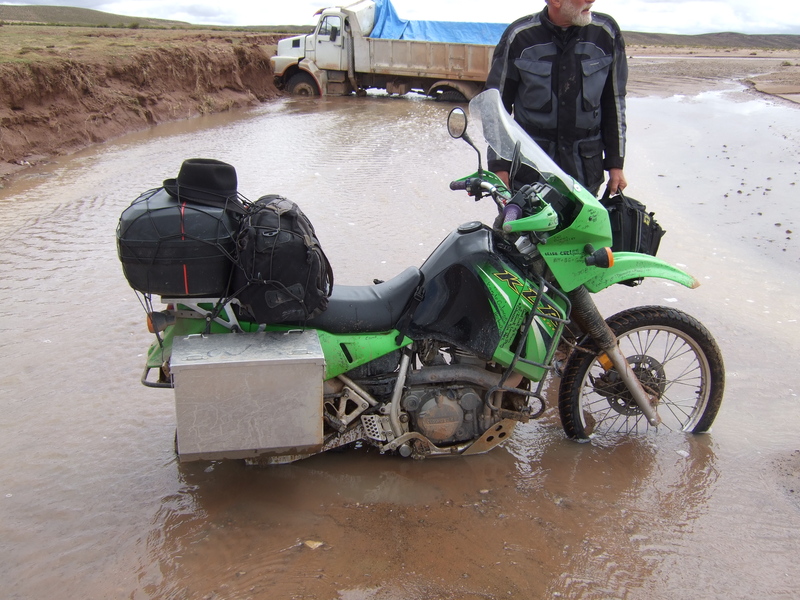 With mud up to the rear axle, we removed all the baggage and I managed to push and force the bike back to the shore over the mud. We pre-emptively removed my Dad’s luggage and he made sure and got a running start, and managed to clear the deathtrap with no more hassle than needing to carry his things over the river to repack them on the other side. Miles and hours of road passed, and while the road was still horrible to drive on, there became less and less mud as we entered a sunny day with no rain, the first day with no rain since we left Nasca 11 days before. 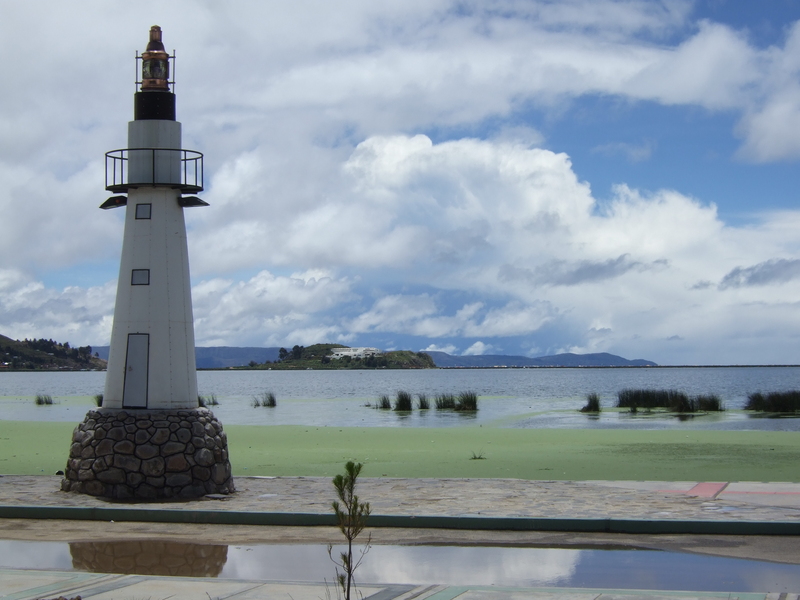 In the early afternoon, we arrived in Uyuni, and were amazed to see foreigners, hotels, and pavement, though the last of those was still filled with potholes and standing water. Joe was in so much pain by this point that he wanted to stay another day to recover from his chest injury, so we went on one of the most comprehensive hotel searches of the trip, stopping at every hotel in town in hopes of a reasonable place with internet and parking. We never found internet, but we did find a few places with parking and acceptable rooms. We went to lunch to clear our heads next to the most promising hotel, one with a GS parked inside. After lunch, we walked back to the hotel only to find it had filled completely up. Frustrated at having to settle, we took a place just down the road that didn’t have parking, but was reasonably priced. Around then, my stomach started acting up again something awful, which was exactly what I needed after another exhuasting day of terrible roads. To add to the fun, the electricity went out, and after using the bathroom (thanks stomach problems) I found out the water was also out. The power came back a few minutes later, but the entire city was without running water the rest of the night. Let me tell you, nothing’s as fun as having an upset stomach with no running water. Uyuni itself was a complete enigma. Seemingly unreachable by any sane method (the road out of town was, though not equally bad, no picnic for anything lacking four wheel drive), it was utterly packed with foreign tourists there to see the salt flats. There were tour agencies, internet cafes, hotels, and restaurants lining every street. Despite this, given our accommodations and mutual desire to get the hell out of Bolivia, my Dad decided perhaps it wasn’t so important to have a day’s rest in Uyuni. As a result, we essentially skipped entirely the salt flats we’d come so far out of our way to see, never signing on for a tour, but instead tearing out of town bright and early the next day. Already full on gas, we followed confusing directions repeatedly in an effort to escape the city. Before we got out, we had a wonderful tour of the town dump, which consisted of a road through an undeveloped part of the desert valley in which the city was situated with garbage piled for miles and miles. Eventually we managed to catch the right road out of town, on another glorious washboarded excuse for a road. Thankfully, it was another day without rain, and the road had once again improved a tiny bit from the day before. The terrain had also improved. Mostly gone was the completely flat, completely boring highway, replaced by a mountain dirt road with genuinely impressive scenery, and more genuinely impressive road. Looming in the distance for the first half of the day was an amazing snow covered pyramid-shaped mountain, and the latter half held mountains with shiny multicolored rocks flowing out of the dirt like stained glass. Despite our second day in a row without rain, there was still an awful lot of water in the desert, and we still crossed puddles and rivers like it was going out of style. After I crossed one particularly large muddy river I attempted to put my bike on the stand to give advice to my Dad on where to cross, but the rock I picked to hold it up in the mud slipped and the kickstand went shooting down into the soft mud. I managed to hold the bike up temporarily, but I couldn’t save it, and when I tired, it tipped down into the mud. My Dad crossed find without my help, and we picked it up and continued. We called it "The Matterhorn"
We were yanked back to reality when we descended down a mountain into one of the few towns on our disaster of a road along a steep curvy road, right along a particularly scenic mountain oozing with an array of amazing colors when the road switched from dirt and rocks to packed down garbage. The road literally became the dump! As we desceneded down the road/mountain of garbage, we passed dozens of people standing alond the side of the road, watching as a large construction project, a bridge over a big river, was being worked on. Our garbage-filled path ended in thick mud at the base of the bridge, and a cop at the scene came over to talk to me. In a decent attempt at English, he explained that the bridge was closed – which was clear – and that we’d have to cross the river on our own. Music to our ears considering our descent had shown us that the river was massive, and the riverbed, always a sandy muddy pit of offal, was about a quarter mile wide! The policeman gave us poor directions to the preferred river crossing, and after driving through the depressing town, over a railroad crossing, and through tons of mud, we found a place to watch a 4×4 drive across the river. From what we saw, we could tell the water wasn’t too deep for our bikes, but there was clearly a crazy amount of mud. 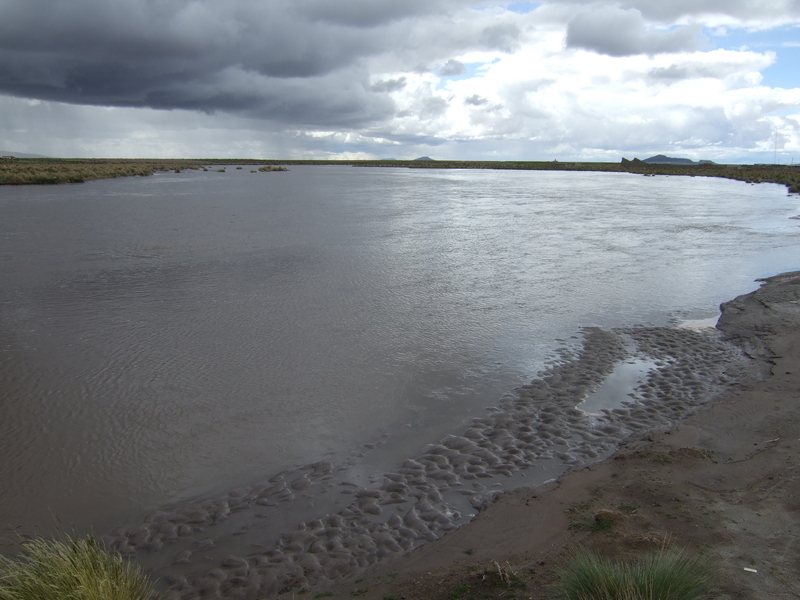 The flowing water portion of the river was seperated into several streams, seperated by multiple muddy banks, each criss-crossed by numerous water-filled truck tracks. After psyching myself for crossing the long perilous river, I set across. I made it over the first couple streams with no problem, and found myself facing the final, and largest, part of the river. The banks except for in the semi-defined path were very high and sandy, and turning was nearly impossible in the water, so getting lined up was crucial. Unforunately, there were also many truck tracks on the sandy median, and in my attempt to find the right place to begin fording the river, my front tire came into one of the tracks at a funny angle and sank several feet down, stopping the bike in its tracks, with the inertia pulling the bike instantly down. It was all I could do to keep the bike from sinking completely down into the mud, and I managed to hold the thing a few inches off the ground while my Dad came across to me to help me lift the bike for the second damn time that day. We managed to again get it upright, and I finally handled the last stretch of river iwth no problems. My dad made it all the way to the final bank of the river before he ran into his own set of problems. 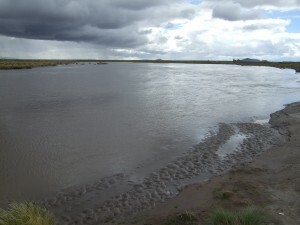 After hitting a big rock in the final stream of water, his bike had been deflected from the bank worn down by traffic to a high sandy one, where the front wheel had managed to make it to the flat mud above, but the heavily laden, smaller back tire only buried itself miserably into the wet sand. I got behind the bike and pushed as Joe gave it gas, but I only managed to get flying sand in my face, up my sleeves, in my hair, and all over the back of his bike. We gave up on trying to use the bike’s own power to drive it out of the sand. Instead, we unloaded it and began hauling it up and trying to pack sand under the wheel, slowly inching it back to a usable spot. While wrestling with this, a group of three Bolivians on their way across the river offered to give us a hand, and with their help, we easily wrestled the bike onto slightly more reliable ground. From there it was back onto the road, where we ascend once again into crazy high plains. Quite suddenly, the world opens up on both sides showing us that we are, indeed, at the top of the world, as we find ourselves riding a ridge with huge dropoffs on both sides, and the road higher than nearly any (except the Matterhorn) of the visible mountains in the area! With no more up left to go, the road went steeply in the other direction, becoming gravely, lumpy and steep. Running water had cut deep ruts through much of the steep roads, leaving potholes, dips, and often huge crevices through every part and direction of the road. While coming down one stretch of road, we came around a corner upon a slow-moving car and had to brake. My Dad came to a stop just to the right of a huge crevice, and with nowhere to put his left foot, toppled over. Thankfully, given he was stopped, neither him nor the bike seemed to be injured. Our third bike to lift that day, I was stuck with most of the work since my Dad’s lifting power was impeded greatly by his earlier chest injury. This one was particularly bad because of the downward pitch of the road and the crevice into which it had fallen: it was actually at worse than 90 degrees from upright! I managed to get my body under it and hauled the heavy thing up (after we took off some of the heavy baggage thank god), but afterwards, my lower back really started to ache. Now that we’d both managed to become quite sore from the Bolivian road of death, we continued on with our last full day in Bolivia to the town of Tupiza. Thanks to our multiple motorcycle incidences, the large river being the worst, we only managed to hit Tupiza at nightfall, passing through some of the most impressive scenery (giant red rock spires, beautiful valleys, mountain skylines like those of the Badlands in South Dakota, etc.) of our Bolivian journey with only the last glimmers of daylight to illuminate them. Entering town we passed another police checkpoint, this one confusingly extremely busy, and despite having to pay $1 USD each to pass, obviously legitimate (we got receipts and no one waved a gun at us!). We passed through what seemed like the town’s downtown without seeing a single hotel, and hardly a single open store, and our hearts sank. At the end of the road into town, we were facing a river with a very busy pedestrian bridge across it, and more lights glimmering on the far side. A local got off a truck and stared at our motorcycles long enough I felt obliged to ask him for directions, and he told us where to go to find the vehicle bridge over the river (there was one!!!!) and that we’d actually find hotels on the other side. Following the guy’s directions, we passed through a road that couldn’t possibly have been meant to be the through road; it was like someone had taken a snapshot of one of those massive wave pools at a water park, turned the waves into sand and sent cars over it. We bumped along till we met up with a road that was actually paved, and crossing the bridge into town, actually found real civilization, including multiple hotels. We found a nice place with a pool and parking, and checked in for the night. Afterwards we set out looking for food only to find Italian restaurant after Italian restaurant, all advertising pizza, seemingly the Bolivian answer to tourism. We finally found a place that didn’t claim to be an Italian restaurant (though it sold pizza anyways) and had dinner. The next morning we had a great buffet breakfast at our hotel where we found the place once again stuffed with foreign tourists there to see the salt flats. We also felt better about our decision not to tour the salt flats ourselves when an Australian guy there told his horror story of having the truck he’d been in for his tour break down leaving him and like 8 other people stranded overnight to sleep in the 4×4 with no food. To add to that, when they got to the salt flats, it was too wet to go into them, and they just drove around the outskirts. Pass. Afterwards we hit the road again. On our third consecutive day without rain, the road was actually reasonable, partly because this one had actually been partly taken care of. There were still horrible potholes and washboard roads made to loosen fillings at even moderate speeds, but we were mostly able to operate in second or third gear, and for the first time in 3 days, I shifted into fourth! There was tons of road construction, and with the road dry, a truly ridiculous amount of choking horrible dust. There are still a hand full of rivers to cross, and we once again cover ourselves in thick nasty mud, but finally, we reach the end of what seems like a lifetime of terrible roads and reach an honest to god paved highway! We had this wonderful marvel of modern technology for all of a few miles before reaching the confusing border city, where we dove once again into the thick of bureaucracy. There was an absolutely massive line to clear exit immigrations for Bolivia, with the line doubling back after a good hundred yards and over 300 people waiting, mostly from buses. While I waited, my Dad went to make sure we were in the same line, and after talking to a border agent, the guy announced to a few other officials that we were gringos, took our passports past the front of the line and behind the counter, stamped them, and returned them to us, thereby clearing Bolivian immigration in only a matter of minutes instead of the 2+ hours it seemed the rest of the people were destined to wait. For once it pays to be an American abroad!! Afterwards it was on into an even longer line to really enter Argentina. But more of that in our next long-winded edition! Guy’s, you came in the raining season, wich is pretty bad considering the quality of rural roads, also Bolivian gasoline unless you can get the premium wich is rare, most sell the regular dirty one which will clog up your bike’s carburator you need to put a bottle of carburator cleaner everytime you fill up. Have a safe trip. nice read! 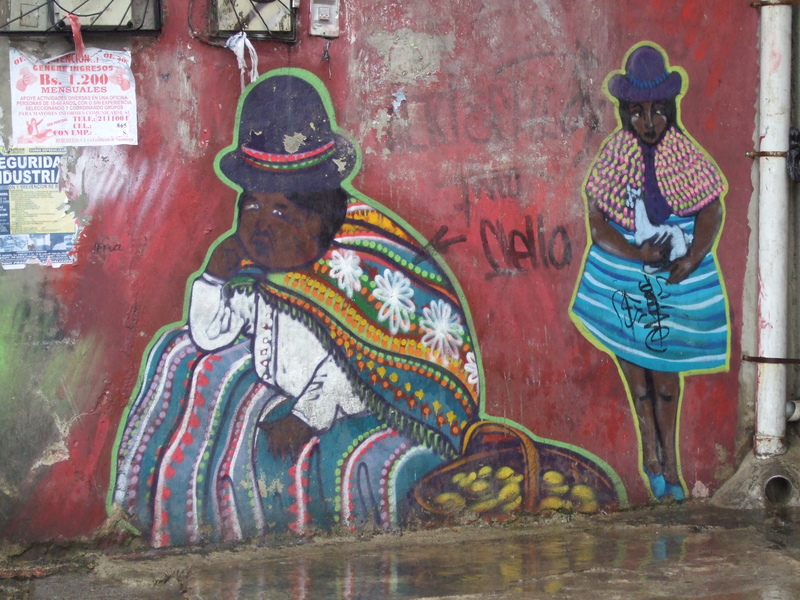 arodi guaran on Tikal, Guatemalan Accidents, and Entering El Salvador – Oh My!